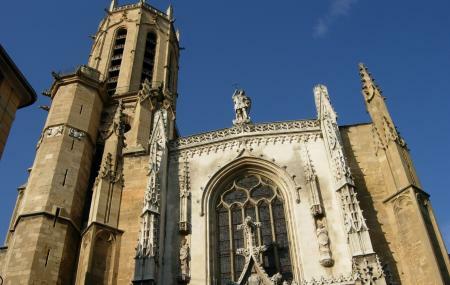 One of the most important religious structures in Aix-en-Provence, the Cathedral St. Sauveur dates back to 4th century. But the major part of it that stands today belongs to 15th and 16th century. A priced possession given its remarkable art works like the notable Triptch in the St Lazaire with its three panels that depict the burning bush was painted by Nicolas Froment of Avignon and was commissioned by King Rene in 1475. The structure went through a restoration and the left and right panel depict the Good King Rene and his second wife Jeanne de Laval. The Mary and Jesus are glorified in all revitalised colours. The magnificent cloisters, peaceful oasis of arcaded and columns are not to be missed on the visit! Special exhibitions take place time to time and have. Mass Sunday 10:30 am & 7:00 pm. How popular is Aix Cathedral? People normally club together Granet Museum and Pavillon De Vendome while planning their visit to Aix Cathedral.